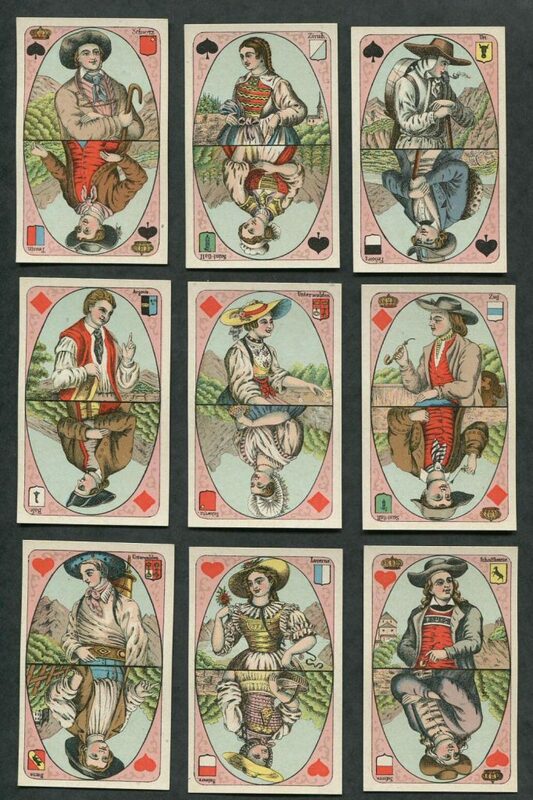 32 cards engraved cards by an unknown artist from a pack of 52 – initials IS or SI. Cards are hand coloured and reflect hunting and animal scenes from the serious to the comic – don’t you just love the 10 Spades with the cat fiddling as the mice dance aground at his feet ! Virginia Wayland states in the IPCS Journal Volume XIII, No 1 [ August 1979 ] that these cards must have been seen by John Lenthall as he followed the design in his Forest Cards [ Pack No: XXII ] often reversing the image. Uniqueness is a word we don’t often use but in addition to this decks obvious rarity it also bears an English Hand Tax Stamp of c 1712 a Red Stock in Hand Stamp which would have been applied on importation. Condition is varied and the high definition scans of the cards reveal all. 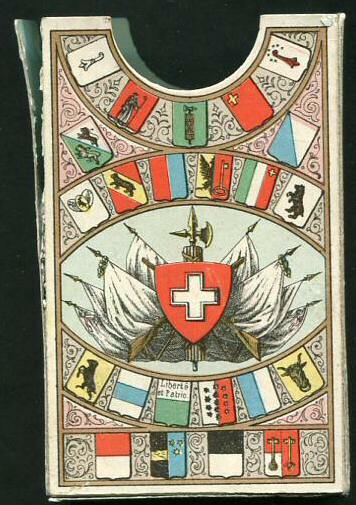 Full pack 32/32, Piquet Pack, of Playing Cards made in Switzerland c1810. Printed from woodblocks and stenciled coloured. French suited and made by “D V a Lausanne” shown on the Jack of Clubs. 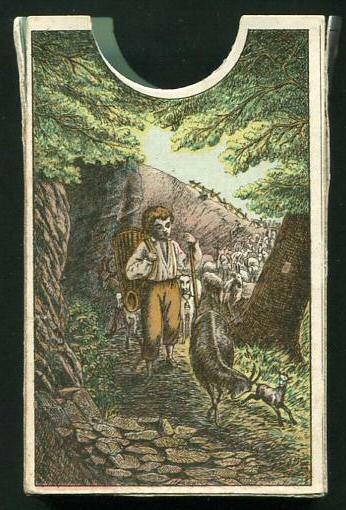 [ David Vachet “Cadet”, cardmaker in Lausanne before 1850 – our thanks to Walter Haas ]. The cards have plain backs and are in excellent [ 9/10 ] condition. This is a piquet deck, 32/32, playing card set of non standard format. The cards have been cut from sheets and mounted, then bound in Morocco leather. The cards are from the magnificent collection of Rimington-Wilson which was auctioned in the 1970s, this pack being purchased by Sylvia Mann. 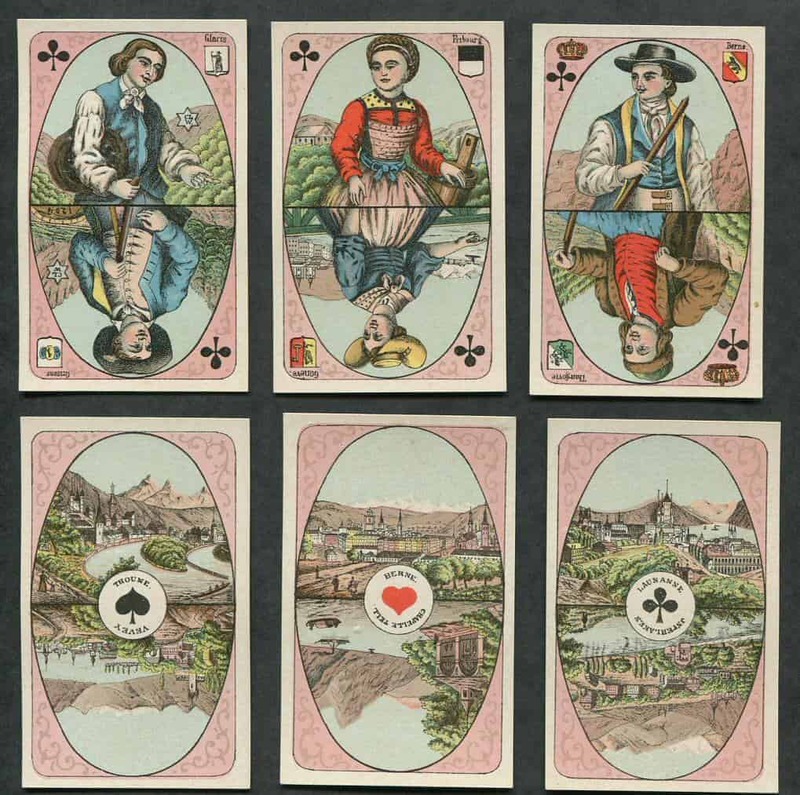 The hand coloured cards depict four armies, Hearts depict the French; Spades, the English, Scottish and Irish troops; Diamonds the German troops and Clubs the Russian soldiers. The cards are depicted on the banners carried by the soldiers. The court cards have Queens as female figures on the flags, the Kings shows Generals and their aids and the Jacks portray single solders from their respective countries. The Ace cards depict soldiers with cannon(s) all other cards show rows of soldiers in various positions. Good condition throughout – scans have slight blurring due to difficulty of scanning books. 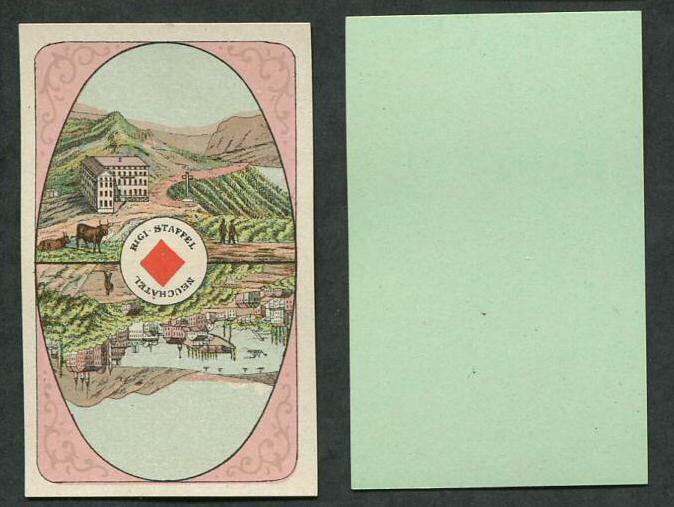 This is the earliest of the Geographic Playing Cards published by Henry le Gras. They are unsuited but with indices 1 to 10. Court cards are not indexed. All cards are hand coloured. This pack consists of 51/52 and lacks Ace of African and title card, both present in black and white facsimile. The cards have had borders trimmed and are mounted and bound in Red Morocco leather. There is very minor foxing here and there and two cards have minor surface damage, these have been scanned. An extremely scarce 17th century example of early pictorial, non-standard playing cards.